2mm North East Area Group: All change.....! 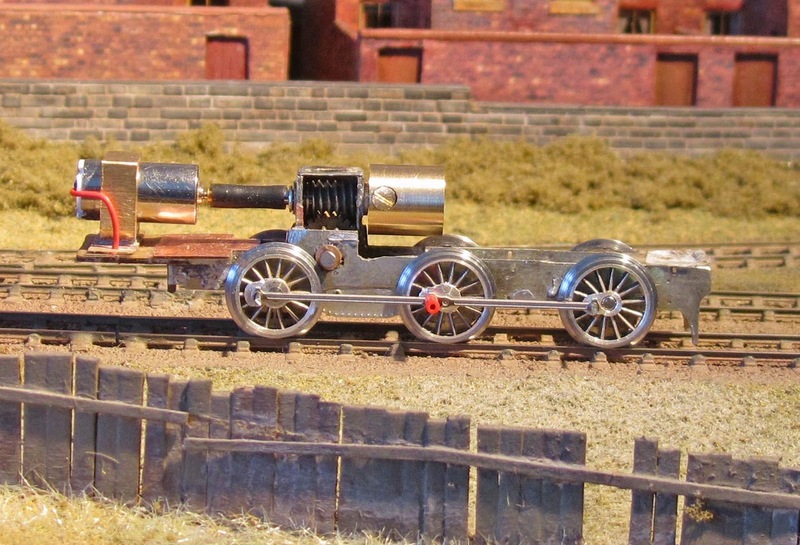 Anyone who has been following my blethering on the construction of the N10 0-6-2t recently will know the chassis has had two motors and that they have been in a couple of positions because I wasn't happy with either the look or the performance. Well it has changed again. A glance at the pictures will show I have done what I didn't really want to do and put the Nigel Lawton motor in the bunker. Having done it I see it is not as obtrusive as I thought it might be. That's because the flywheel type of universal coupling I engineered in an earlier incarnation has been dispensed with in favour of a completely separate proper flywheel. The discarded flywheel coupling mentioned, the design of which I have used perfectly successfully before in tender engines, has been replaced with a piece of bicycle rubber valve tubing. The tubing is a nice interference fit over the 1.5mm diameter shaft on which the worm slides and although the motor shaft is only 0.8mm diameter Nigel Lawton sells the sleeves that increase this to 1.5mm so it's a doddle to do. This arrangement occupies much less space, is easier to engineer and is also one of the reasons I was able to 'go' with the bunker mounted motor. I have not yet fitted the resistor but for the purposes of testing, as long as I don't crank it up to anywhere near full speed or place it under load, I think I can get away with that. As promised in a previous posting there is now a video of the chassis and the loco with its footplate and cab sides etc. running back and forth on Wansbeck Road. 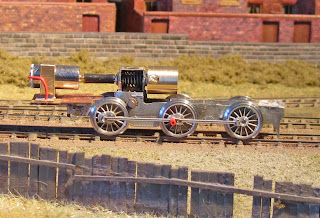 Trailing wheels are yet to be assembled and installed but at this stage I am almost satisfied with the running and it may very well improve with the extra two wheels picking up. 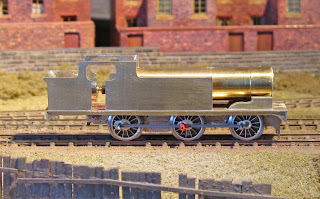 All in all, I'm quite impressed with these little Nigel Lawton motors. Above - The chassis. A piece of double sided PCB provides the platform for the motor mount and as mentioned above there is no resistor yet. Above - The loco so far. Note the low visual impact of the motor in the cab easily hidden by a driver. Above - A little bit closer so you can see the front millimetre or so of the motor and the drive shaft. nice video. 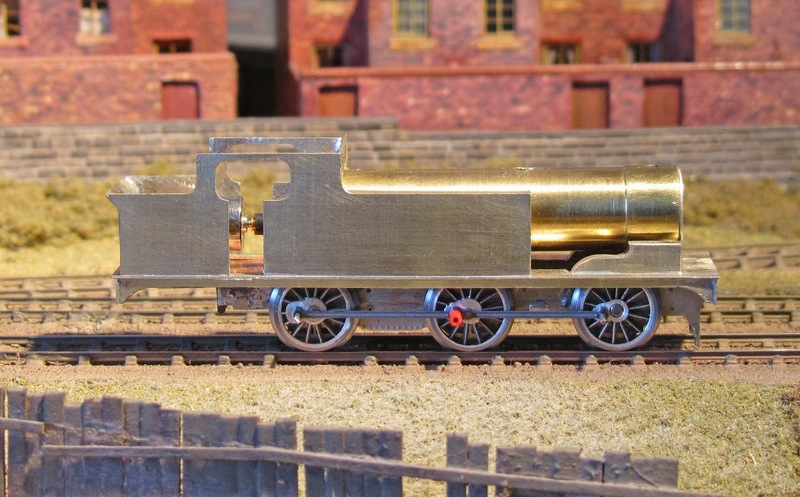 But ignoring the loco for the moment, how do you do the chimney pots on the terraces? The ones behind and to the left of the wire works as well as the station and Belmont Junction Cottages are John Piper or Scale Link castings (can't remember which) and those to the right of the station are cut down cocktail sticks.